Are you considering being an early intervention OT? Being fresh out of school and on the hunt for your first job as an early intervention OT can be extremely overwhelming on its own. Especially when trying to visualize all the pros and cons of each different setting and population that you could work with. In school, we aren’t able to feel or witness the realities first hand (both the rewarding and the challenging parts) of each setting in occupational therapy. As OTs, we are both fortunate and unfortunate to experience so many different settings and populations that it is both exciting and overwhelming. So much that it can be daunting at times. If this happens, it can be helpful to hear or read someone else’s experiences within that setting to determine if it is something that you could see yourself doing. 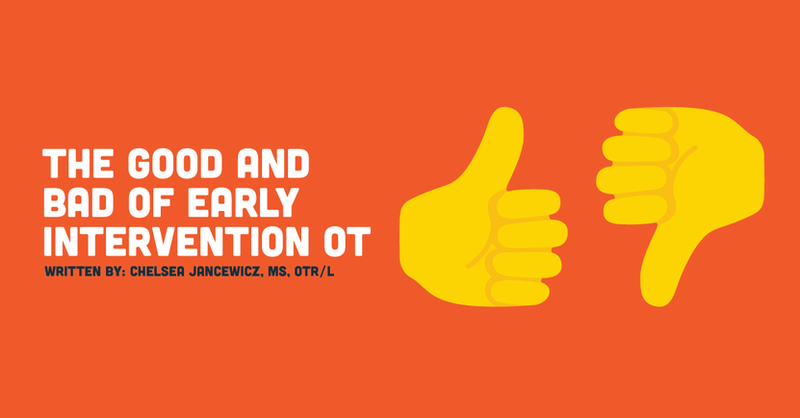 Here is the good and bad of life as an early intervention OT. This can be both a pro and a con to certain people. For those of us who thrive on change and mixing up your work environment, this is definitely a positive aspect of the job for you. Some people feel that being in a constant state or environment can be draining and can cause loss of attention or motivation. Others mix up their environment in order to increase their attention and alertness. Being in a constant environment can be draining matter how stimulating or non-stimulating it may be. Being therapists, we tend to prefer to be on the go with chaotic schedules and hustling from client to client. Being in someone’s home is like entering their private safe haven. It is where the child plays, eats, sleeps, and interacts with the most important people in his/her life. Entering that space and establishing a bond is one of the most intimate experiences for an occupational therapist. You also establish a very intimate relationship with the child’s caregivers. This is also the caregivers’ house where they play, eat, sleep, and interact with their loved ones. This intimate relationship can often result as the family trusting the therapist as a family member or close friend (but always be careful to remember the client-therapist relationship!). Seeing the child in his/her home allows you to see what materials they have access to and what occupations they are most drawn to within their home. Being an early intervention OT allows creativity in using everyday items and materials to encourage sensory integration as well as the development of ADL and IADL skills, fine motor, gross motor, and sensorimotor skills. Having the caregivers present and seeing how the OT uses their own materials is often encouraging for the caregiver and makes carry over of therapeutic activities seem less daunting to implement. Early intervention OT is very child-centered and child-directed. So, you get to be a kid in the kiddo’s home with his/her toys! Getting on the floor and meeting the child at his/her level is a fun treatment model. Floortime is one of the most used treatment models when working with the EI population. Channelling your inner child and creating ways to help shape their behavior into something more functional can be a great way for those of us who haven’t fully grown out of our childhood days. Home-based care takes a toll on your car. Adding mileage, frequent trips to the gas station, car maintenance, accidents, tickets, oh my! This can be scary for someone who is not especially fond of driving to begin with. Driving from client to client can not only be exhausting on your car but also your mental health. There are days when traffic is so crazy that it’s hard to even stand to be in the car for one more minute. The process of stressing out between clients due to traffic, time constraints, or just being alone in your car all day can really affect your life both during and outside of work. It is all too common to see someone’s personal life unravel due to overworking oneself or misery in the workplace. It is important to set yourself up for success. Always allow extra time between clients in case there is bad weather, traffic, or even just to allow yourself 5 extra minutes for you to relax in your car and take a mental break before walking in the door. In early intervention OT, you should be using the family’s materials and toys, but there are some instances when it is challenging to use only their materials. For example, I have sensory integration equipment in my car that I often trial with kiddos and their family. Having items like these in your car can turn your private car space into a mini office. This can make it feel like work is always with me. Often EI therapists find that their car is where they finish writing their notes, send emails, make phone calls, or even eat your lunch. To offset this feeling, it helps to find a clinic that allows you to have a home-base. This also allows you to have time to return phone calls, answer emails, or keep materials in a more office-type environment rather than having a mobile office. Driving from home to home can be very lonely at times, especially if you have just had an emotional session or an overall emotional day (we all have those when working with people in challenging situations). There will be times when I leave a client’s home and want to scream or even cry. Being occupational therapists, we tend to take on our client's emotions and feel exactly what they feel. A parent may come to you crying and asking you to explain why her child has autism, or why he won’t stop hitting himself. Conversations like these can take a toll on you, too. It is important to really establish a support system whether it be co-workers at your clinic, colleagues on the child’s team, or a mentor. However you can, it is important to keep yourself balanced and level-headed, especially on those tough days. Unfortunately, many employers don’t have this system. So if a client does not let you know they need to cancel in advance, then there cannot be another client scheduled to be seen in their place. This means that you won’t get paid for that hour that was meant to be spent treating the client. So, plan for cancellations! Create a safety net and figure out the bare minimum of how many clients need to be seen per week or per month in order to not have a financial crisis.